Election Protests Spread Across Haiti Haitian officials announced preliminary election results from last month's presidential vote, and the tally has only stirred more anger, violence and protests. Officials announced that government protege Jude Celestin and former first lady Mirlande Manigat would advance to a runoff in presidential elections, leaving popular singer Michel "Sweet Micky" Martelly out of the race. Haitian officials announced preliminary election results from last month's presidential vote, and the tally has only stirred more anger, violence and protests. Officials announced that government protege Jude Celestin and former first lady Mirlande Manigat would advance to a runoff in presidential elections, leaving popular singer Michel "Sweet Micky" Martelly out of the race. The Haitian capital descended into chaos today as supporters of presidential candidate Michel Martelly flooded the streets. They blocked roads, clashed with security forces and even set fire to the ruling party's headquarters. The protestors denounced election results that eliminated Martelly from the second round of the presidential race. NPR's Jason Beaubien reports from Port-au-Prince. JASON BEAUBIEN: Crowds of thousands of young men surged through Port-au-Prince today, shutting down the entire capital. Some wielded machetes and sticks. This particular group was shouting that they're going to burn the city down if Michel Martelly is not named the next president of Haiti. Late last night, election authorities announced that by a few thousand votes, Martelly had been knocked out of the presidential runoff. Robert Junior(ph), with sweat dripping off his forehead and clutching a Michel Martelly campaign poster, was in one of the jogging mobs on Rue Pan American. Mr. ROBERT JUNIOR: (Through translator) We are protesting until they respect our rights. If they don't want to hear our voice, we are going to turn this protest into a civil war. But everything will get destroyed. BEAUBIEN: The protestors accuse President Rene Preval of rigging the elections to favor the ruling party candidate, Jude Celestin. On election day, Michel Martelly and 11 other candidates made exactly the same accusation. They said there had been massive fraud at the polls to favor Celestin, and they called for the elections to be annulled. The next day, Martelly backed away from that demand when it appeared that he was leading in the exit polls. 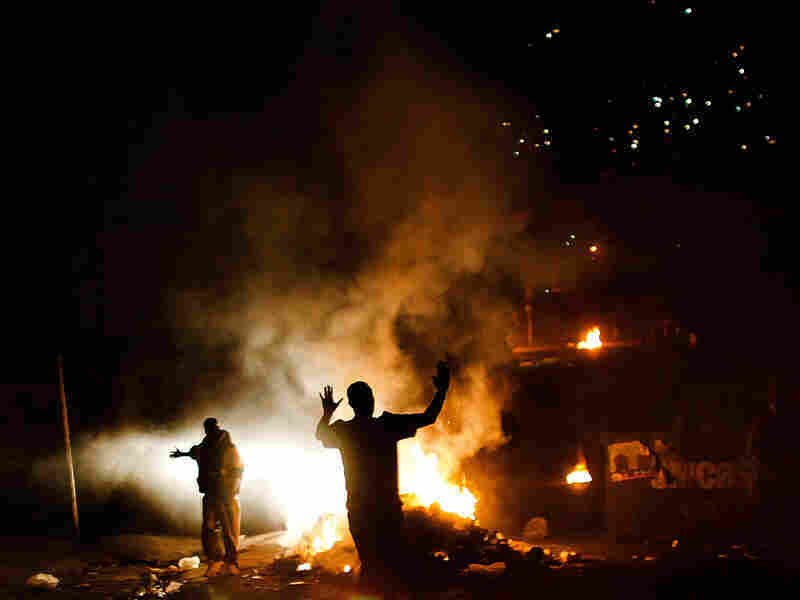 Haitian police and United Nations peacekeepers used tear gas to disperse huge crowds in several parts of the city. A mob set fire to the ruling INITE Party's headquarters. Businesses were shuttered, and American Airlines cancelled all of its flights in and out of the capital. Most major thoroughfares were blocked with barricades and burning tires. Outside several of the camps for earthquake survivors, people overturned portable latrines, spewing sewage into the streets. Mr. FREANTZY FLEURISCA: Trouble and trouble, trouble with Earthquake, trouble, trouble, trouble. Haiti live in trouble, trouble country. BEAUBIEN: Thirty-one-year-old Freantzy Fleurisca(ph) normally sells painting on the street, but a mob set fire to his paintings, destroying all of them. Fleurisca says the trouble just doesn't stop for Haitians. Mr. FLEURISCA: I don't know what's happened to us. We don't know what happened because after this problem, and there's a big one coming. After that is a big one coming and we don't have leader. We don't have leader. For example, there is many country, when they have problem, they come to their president. They say: Hey, we have this problem, and they help them. And even though we have problem, we don't know where we can go. BEAUBIEN: And in Haiti, elections have often brought problems and violence with them. It was only in 1990 that Jean Bertrand Aristide became the first democratically elected president of the country, and he was then ousted from office twice. And current President Rene Preval came to power in 2006, when his supporters took to the streets. Preval had 49 percent of the vote but need 50 percent to avoid a runoff. Finally, Preval was simply declared the winner to put an end to the civil unrest. Preval spoke to the nation today and called for calm. President RENE PREVAL (Haiti): (Speaking foreign language). BEAUBIEN: From an undisclosed location, President Preval, speaking over the radio, told Haitians that they have a right to protest but not to destroy. He said the polls and the vote count were carried out in a transparent and fair manner. Preval lashed out at the U.S. embassy, which released a statement last night expressing concern that the announced election results were inconsistent with what international observers saw on polling day. Preval said the U.S. embassy is not the Haitian election council and has no jurisdiction in this matter. The current president also pointed out that candidates have 72 hours to contest these results. Michel Martelly didn't appear in public, but in a brief statement that he read over the phone to a local radio station, he said the country is burning because election officials put out the wrong results. His campaign says Martelly is preparing a legal challenge to the election.